We Like the Way Apple Thinks! Steve Jobs, CEO and marketing brainiac behind the Apple brand, knows how to promote like nobody else on earth. A list of technology products powered by the Apple brand reads like a who’s who list of “must have’s” for the twenty-first century. 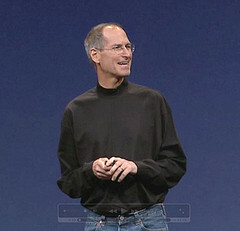 The undisputed fact is that Steve Jobs products work because he manages to tap into the cult of cool, but is there something else at work here? Maybe a basic marketing strategy that insures the latest iteration of iPod, iPad, iPhone, or Mac computer all but fly off the shelves? It’s this same tactic of limiting supply that drives the unique style of real estate auctions at Open Door Auctions. Think about it like this. What does the average old-fashioned real estate agent do to sell your house? He holds open houses ad infinitum until everyone in the county with even a passing interest in buying a house has already traipsed through yours a few times, liked it, didn’t like it, became bored and moved on to the next one. Nothing wrong with your house (probably). You’ve just seen human nature in action. We yearn for the new thing and don’t mind paying more to get it, but we also grow weary of something quickly. That’s why our tactic of limiting the open house process with the properties we list is so effective at drawing more bids. It might not be accurate to say that interest is at a fever pitch level in every case but it has a darn better chance than the typical overexposed traditional real estate listing. When it comes to generating buzz and word-of-mouth, overexposure is the enemy. Ask Charlie Sheen. Not so long ago people thought he was actually sane. We like the way that Apple thinks. Underexposure is the key to increased profits (Flickr / Danny Novo).